Set in a peaceful and tranquil location, yet only 8 miles from Disney-, has every possible resort style amenity at your disposal. 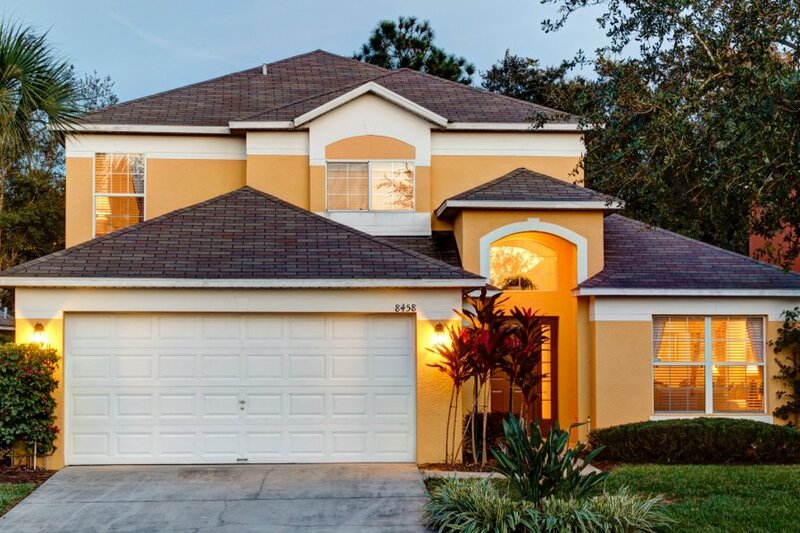 The luxury accommodation of Secret Key Cove Villa (an executive style spa villa) is set in Emerald-Island-Resort, a gated community with strictly controlled access and is the ideal location from which to explore and enjoy all the attractions Orlando a has to offer. A calm and relaxing place where you can recover from the hectic pace of the theme parks and attractions. The Villa :........................ Its all about having enough Personal SPACE! And this fabulous villa has it! This beautiful holiday home, has been thoughtfully furnished by its owners to create a vacation home with a stylish contemporary feel, ensuring plenty of individual living space. The 2 story executive style Villa has 4 bedrooms 3 bathrooms, and its own private swimming pool.Luxurious Spa with mood lighting. The entire house is air-conditioned and tastefully decorated with TVs throughout, with a family room-sitting room- formal dining area - breakfast nook-fully fitted kitchen with all mod cons including a utility room and a best in class games room. And Emerald-Island-Resort is the best location to explore the attractions F-l-o-r-i-d-a has to offer. A superbly managed resort with the club house as the center of activity and 5 star services. Emerald -Island-Resort is a "land island" amidst a sea of lush vegetation. Resorts unique impression of place. Once inside, you feel as if you have entered a special preserve. Emerald-Island is surrounded by a Conservation Area and encompasses over 300 acres with 11 heavily wooded acres right in the middle of the community. Only a few miles from Disney and a short walk or drive to shopping and dining, this "island" serves as a haven from larger world while remaining central to everything the worlds most popular destination with millions of visitors a year to offer. Emerald-Island-Resort Clubhouse is the vibrant center of activity for the community. Even though your home is close to the areas most renowned attractions, the activities and amenities of this venue are so special you and your guests may choose not to leave. The Clubhouse is the source for premier service. A helpful staff member will assist with dinner reservations, attraction tickets or transportation. The staffed Clubhouse has plans to provide towel service and music at the pool, movie rental and other thoughtful touches to make your visit to Emerald-Island-Resort a worry-free experience. Includes Games room wit, air darts, air hockey. pool table, Foos Ball, Play station 2 - X box 360 & a selection of movies and games ( inc Rock star) with large selection of books & magazines. Free wi-fi & free local and National (usa) telephone use. View from pool area is of wooded nature conservation area. Internet is available and the club house also has a computer room.